Akai just announced Force – their new standalone music production workstation. The design is clearly inspired by 8×8 style grid controllers like Push 2, Launchpad, and their own APC-40. The big question is – what are the tradeoffs between a comprehensive controller/computer combo like Push 2, and Force? You’d think that it would be just up to the interface, but most of the material differences stem from the fact that Akai decided to base Force on a proprietary hardware/software OS combo, meaning that it can’t run standard Windows or Mac programs. So, what are the differences? Which is better for you? This clip tries to address them all, and if you prefer to read, highlights are written below. 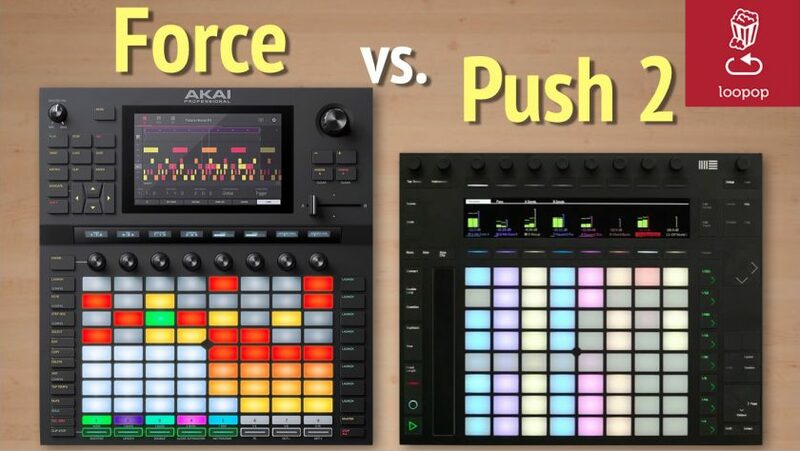 Note that the comparison is between what Push 2 can do as a controller vs what Force can do. The comparison doesn’t include what can be done on Ableton Live using a mouse and keyboard. In my opinion, the biggest thing you need to consider is whether you’re willing to limit yourself to the four bundled plug-ins and 60 or so factory effects in the Akai Force. Force doesn’t support the VST standard, so the only plugins you’ll be able to run are those that come bundled with it, or those the Akai allows to run on it in the future. Ableton Push on the other hand supports the VST/AU standard, which means that it can run any third-party plug-in under the sun. Force does have an interesting auto-sampling or multi-sampling function, which will play and sample an external instrument note by note (with up to 4 velocity levels), which might serve as a workaround to its inability to support plugins or it’s relatively small number of audio inputs. Push 2 support an unlimited number of tracks and insert effects. Force is limited to 8 stereo audio tracks and 8 plugin tracks. Force however can add on top of those up to 128 drum pad and sampled instruments. On the effect side, Force is limited to 4 effects slots per track/send/master, whereas Push 2 does not have those limits. Force has a 7-inch touch screen, whereas Push 2 (and Maschine MK3) have physical buttons with various functions based as written on nearby on-screen labels. Physical buttons are always easier to use; however, a touch screen allows for more versatility. The Force’s touch screen seems fairly responsive though not as animations aren’t as slick nor it is as responsive as modern cell phones. Akai Force currently does not support expansion with class compliant audio interfaces, which means you’re limited to the on-board options. These include only one stereo or two mono inputs, and two stereo outputs (main and cue). Force also has mini MIDI in, out and thru, and 4 CV outputs, as well as two master and one slave USB ports. Force supports WIFI and Bluetooth, as well as Ableton Link via an ethernet connection. Push 2 only has two foot-switch inputs, but is virtually infinitely expandable with a broad range of audio interfaces, MIDI to CV converters and so on. Both Push 2 and Force support assigning tracks to different audio channels and crossfading between them. Push 2, via a max for live plugin (as well as Maschine MK3) supports locking and morphing between multiple parameter values. Both Push 2 and Force have comprehensive support for sampling and slicing. Force’s touch screen allows for more functionality in terms of relocating slices, as can be seen in the companion video. Force has only one looper (and once set of audio inputs) whereas Push 2 allows an unlimited number of loopers if flexible live looping is important for you. Push 2 has one slider which can function as pitch bend or mod wheel. Force’s touch screen can function as a “Kaoss-pad” style XY controller. Force doesn’t currently have a “song” or “arrangement” mode – you can obviously move from row to row on the grid manually. Push 2 is actually quite similar. While Ableton Live does obviously have a linear arrangement mode and you can use Push 2 to perform live into that arrangement, there’s no way for you to re-arrange the arrangement on Push 2 once it has been performed. Akai Force gives Push 2 a good run for its money, especially considering this is only version 1.0. Force’s main limitation in my opinion is that fact that it’s close to third party plug-ins – leaving you limited to the stock effects and plugins. Without audio interface support, you’re also limited to the number of inputs and outputs built in. Force’s limit of 8 audio and plug-in tracks may seem like a limitation, though with the availability of addition drum and keyboard sample tracks, most limitations can probably be overcome. Hi, please enable subtitle in english. Would the force be able to sync with Abelton live ? Like would I be able to play a note on the force and would trigger the note on the computer?